Having taken my DSLR and lenses to every convention before, I decided to eschew (gesundheit) them this year, putting my trust into the far more talented members of the UTS anime club. They all were using Canons not Nikons, but I forgave them ;). I'll post links here to public galleries once they start appearing. Being without a camera was quite a different experience. Rather than watching people wandering and doing things through the viewfinder, I was doing… all… the things! I think I'll go back to taking it, but I'll admit it was nice not having this heavy kit weighing me down, getting in the way of photo requests and so on. The Bird is The Badge! As for the con itself, I built a Gundam[head!] in a workshop, sat in on the seiyuu interviews (blush) and part of the cosplay competition (before other commitments had me assigned to Starbucks, WiFi and a conference call for an hour! ), went to stall after stall after stall and talked to artists, supported our UTS Anime club with a ton of swag, watched some of our club members sing Karaoke (and really well, wow! ), stared in wonder at the Gundam building contest and the people in their ridiculously detailed and spot-on cosuprey, caught up with folks from some of my other uni classes, chatted with some of the lovely staff at Japan Airlines about flights via Singapore, and topped it off with a hot coffee on a cold night with friends :). 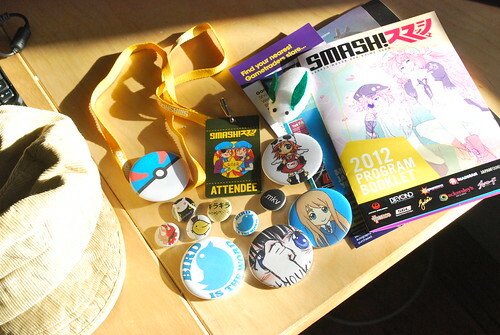 I'd been tempted to become a volunteer for this year's SMASH, but I had insufficient time and energy. I watched in wonder at some of my friends who were volunteers pouring their heart and soul and energy and time and and and and… into it this year, and I think it paid off handsomely! Speaking of handsomely… well okay, it definitely wouldn't be the first term I'd use, more like… passably? 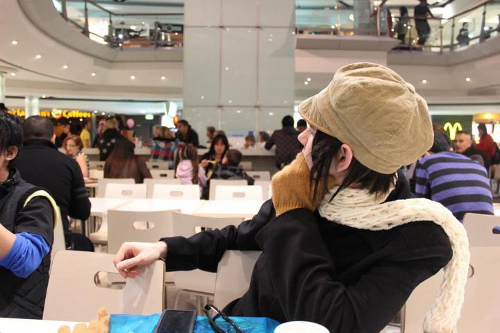 XD I'd felt so dejected and sat having lost all my sci fi and uniforms, but with the help of the super friendly @hanezawakirika (who also had the best cosplay there!) who flew in at just the right moment with a wonderful save, I cosplayed as Yoite from Nabari no Ou! He was the perfect character for someone of my relatively meek but tall build to do, save for the hair! I vaguely remembered the series from 2008, and on the night before watched several of the anime episodes again to refresh myself and help get into character :). Overall I was asked for photos 24 or 29 times, I have it written down as one or the other. In any event, a lot! Had a great time, and the UTS Anime club peeps were far too much fun to hang out with. Thanks guys! :D Ghibli group cosplay next time, for sure! Older post → Borrowers don’t want me dressing like a nerd!